Ah, 2007! What a great year for gaming, as long as you define "great" as a slew of over-hyped titles that mostly turned out above average. What a great year for gaming! 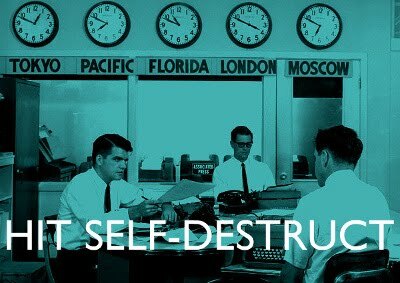 I wouldn't call it a great year for Hit Self-Destruct. I should have told you upfront that I have the gene for unpopularity. Hit Self-Destruct 2008 will be better. It almost has to be. If it's not I will cry. Personally, I think "Game of the Year" is a dumb tradition, especially since it's been co-opted by console partisanship and "moneyhats lol." Nonetheless I am compelled to perpetuate it. Pretty much because otherwise I wouldn't have a post. With that preamble out of the way, I'm ready to announce my game of the year pick. If you want a hint, check the title of this post. Here's something I find interesting about Portal (omg it's Portal!!) I believe it has legitimised comedy writing in the gaming mainstream. I don't mean that it's the first "legitimate" comedy game. It's less of a compliment to Portal than it is an insult to the gaming mainstream, really, or the mainstream in general. The quality of Portal's script has been widely acknowledged in a way that comedy typically is not. While such games are usually praised for being funny (although there's really a ton of allegedly "funny" games which are just terrible,) that's often seen as a separate achievement from "good writing" or a "good story." Sam & Max may make you laugh but if you want good writing you really must turn to Final Fantasy or Xenogears. Monkey Island may be funny but it doesn't hold a candle to the high drama of King's Quest (or to give a less unfair example, Gabriel Knight.) It's a collection of gags strung together and unless it blows your mind or is a gritty thriller it's not good writing. Somehow comedy is lesser. It doesn't require pacing, subtext or structure. All you need to make a good comedy game is the Three Stooges, stoned, in the writing room. Somehow Portal escapes this perception. And why shouldn't it? Portal has probably the best conceived and executed script in any 2007 game, and it's a game predicated entirely on a simple gameplay mechanic. It's tight. No extraneous side quests, items or characters. The advantage of the game's short length is that everything you see is absolutely critical. It ties into the Half-Life mythos, of course, but I don't believe that this cheapens the self-contained story. When GLaDOS warns you about what's "out there", yes, it's an oblique reference to Half-Life, but it doesn't even need to be. It doesn't rely on knowledge of the Half-Life canon: it introduces the chilling point that perhaps things will only get harder for Chell after escaping Aperture Science. The future is uncertain -- which is right in line with Portal thematically: Chell introduces free will into the equation by abandoning the pre-determination of GLaDOS and the test chambers and instead embraces the (much more dangerous) unknown. A woman chooses. 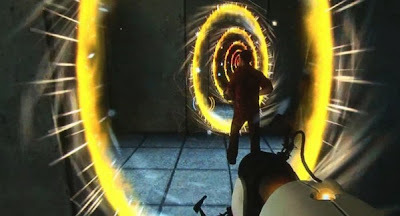 Portal must be the perfect narrative realisation of the Half-Life design aesthetic. It's trite, but it's not the story so much as how it's told. 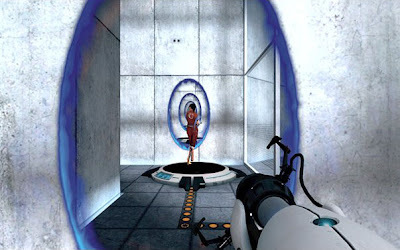 Portal succeeds on both pacing and dialogue (the latter largely Erik Wolpaw's contribution.) The advantage of this design is it never has to pretend you can trust GLaDOS, thereby setting you up for the obvious twist. The player is never in contradiction with the game, and can't proclaim they're any smarter because they "saw it coming." And it's still not wholly surprising, moments like the help messages scrawled in blood and the incinerator room come as welcome surprises. Everything the player learns is what they could realistically learn in that context. "Self-contained" doesn't mean you learn everything, which indeed you do not. There's plenty of room for speculation about how Chell reached Aperture in the first place, some of it supported by in-game hints and this website. And you need to infer backstory from some of GLaDOS's comments -- she isn't teasing you with forbidden backstory for the most part -- everything presented in the game is believable as to what she might actually say. Nowhere does the game become some obnoxious, tacked-on J.J. Abrams clue-hunt, for which I am enormously thankful. At the core of the story, I think, is the relationship between the two antagonists, GLaDOs and Chell. It's a perfectly balanced juxtaposition. GLaDOS is all talk and Chell is all action. In the face of GLaDOS's innumerable monologues, Chell never utters a word, and GLaDOS is largely immobile and, to a degree, helpless. One is mind and one is body. I feel Valve have been more successful in creating a real character in Chell than they have been in Gordon Freeman (not that they were exactly trying with either.) In a way, they're the exact same person (me/you.) They're both essentially devices, and Chell even more so, as she's just enabling you to use this very exciting portal gun. And yet Chell represents more than that. She is such an integral part of the story, it'd be thrown into disharmony without her. And she has no dialogue. Even in this game, almost a soliloquy, there are still other techniques at work to create this character. I believe I began with that very point. Even Portal is more than the one-liners. From start-to-finish it's a smart, fully-realised story that knows exactly what it is doing. More so than BioShock. Sorry, I had to get that in there. Did I really post this on Christmas Day? Consider it my Christmas gift to you. Just kidding, I would never be that heartless. Your dirt bike is in the back yard. I always feel a little bad when i stumble upon a bit of good writing and no one has bothered to comment upon it. This was very well written, and made me want to play the game even more. As it is, I'll have to content myself with looking up videos.